To many visitors to this area, it is one of the most beautiful regions in Bosnia and Herzegovina to visit. Jablanica is found close to the sparkling, fast-running Neretva River. Tucked into the peaks of Cvrsnica and Prenj Mountains, Jablanica also benefits from a somewhat mild climate that ranges between the Mediterranean and Continental, which means a mild summer and even wintertime precipitation. Jablanica has a rich history. During Word War II, it was the site of the Battle of Neretva, where the Partisans managed to win a very unlikely battle. 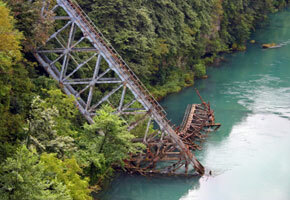 Today, the remains of the destroyed bridge still remain as a symbol of wartime difficulties and sacrifice. Jablanica is a secluded location, but it’s surprisingly easy to get to. You can take a bus to Jablanica from Mostar. One possibility to make your travel seamless is to first fly to Sarajevo via Zagreb on a carrier such as Croatia Airlines, or take a direct regular flight on KLM, Lufthansa, or Jat Airways. Rent a car in Sarajevo and take the scenic one hour’s drive there. When traveling in these mountainous regions, use extreme caution, particularly in the wintertime. Bosnian drivers are comfortable with roads that may seem even perilous to unaccustomed drivers. Stop by the War Museum, which is located near the ruined bridge of Jablanica. The War Museum is dedicated to the battle during World War II, and provides an impressive collection of photographs to tell the story of this heroic event. Visit the War Memorial located on the top of Mount Prenj. On your way back, try an authentic meal of lamb, which is served at stands dotted along the roadsides. Later, have a quiet meal along the eastern bank of the Neretva River. A converted German bunker serves tasty meals in their restaurant, or plenty of hot drinks in their cafe if your prefer. Take a day to visit Jablanica Lake. Not only are there lots of restaurants to choose from, but there are lots of accommodation options and diversions. Walk down the main road after dining out to see the locals’ catch of the day from Jablanica Lake. Take a picture of some massive trout, carp, and bass! Stay in the Jablanica Hotel to explore this small city full of history. With a tiny park located behind the hotel and very comfortable rooms, you’ll want to spend more than just one day in this charming town. Speak with the friendly staff while you’re there to learn more about the city and its history. Whether you’re a war buff or a culture fan, spend a few days in Jablanica to indulge yourself. If you fancy a leisurely stay by the lake, consider camping. You can pitch a tent if you are feeling adventurous, or perhaps book one of the many private rooms, lodges, and hotel suites. Jablanica’s small size makes it a great place to walk with your family. Enjoy the quaint city, and then drive to Jablanica Lake for a day trip.